I talked last week about how crazy it gets from mid-November until the beginning of the year, and this week was the perfect example. Setting aside shopping for food and preparing the feast, even the fun stuff kept me hopping! 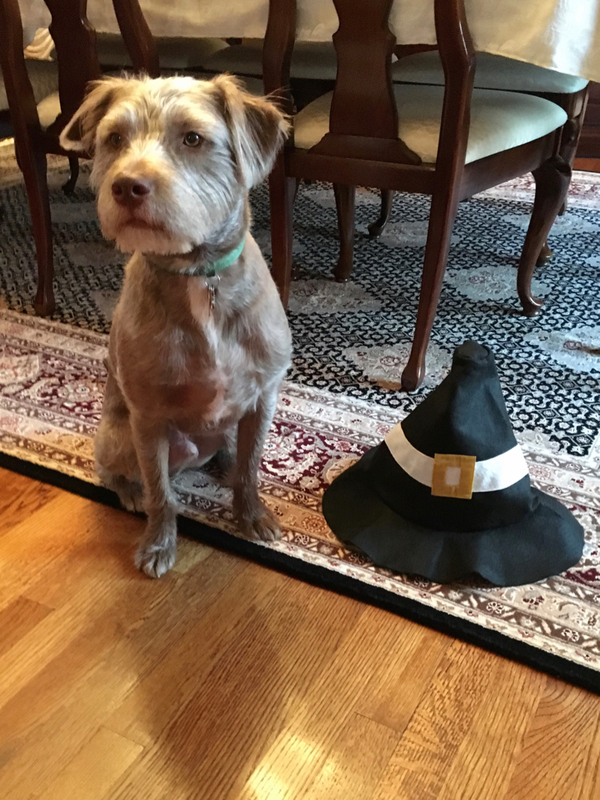 While waiting for our friends to arrive for the race on Thanksgiving morning, I snapped this picture of Pablo with Daniel’s pilgrim hat from the race a few years ago. We tried to take a picture of Pablo wearing the hat, but it was much too big and covered his entire head! After the race (a couple of race pictures are a little farther down), our Cruiser friends came back to our house for our annual post-race brunch. 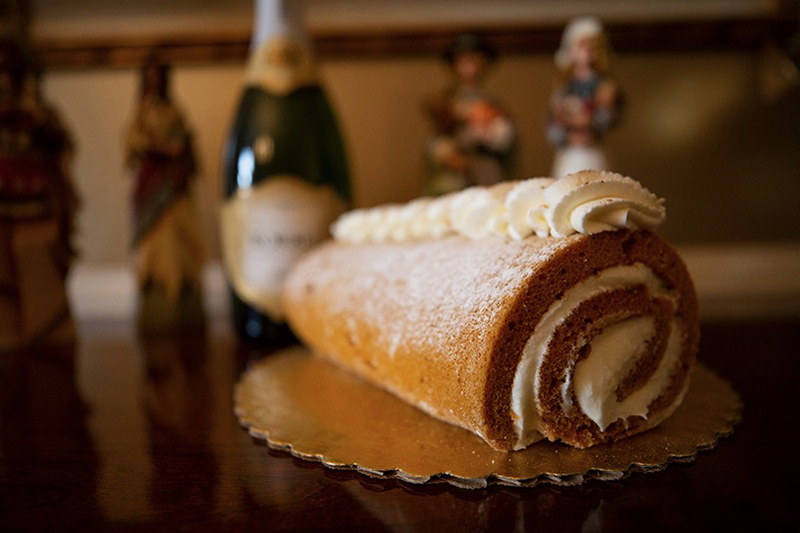 I picked up this year’s pumpkin roll at Wegman’s and it was amazing! No one opted for mimosas so the champagne stayed corked. 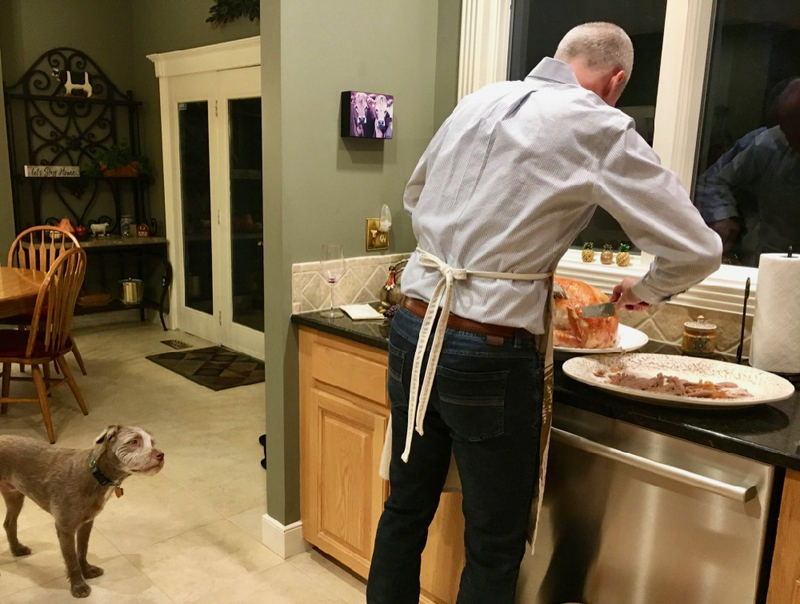 Much later in the day while Bill carved our turkey, I couldn’t help but smile as Pablo watched. I spent much of Friday and Saturday putting up our Christmas decorations, but took time out on Friday evening for our annual book night combined with my birthday dinner. We took advantage of the kids being in town and had a wonderful family evening celebrating both events! 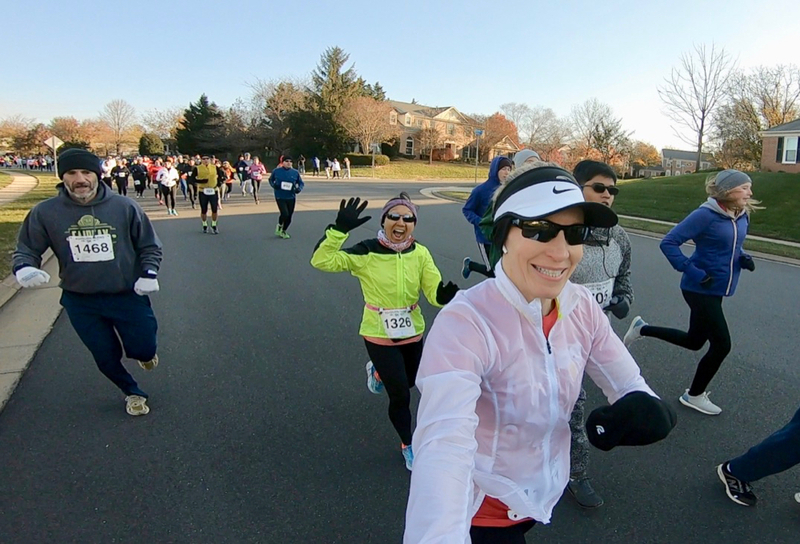 I ended up running only twice last week – Tuesday morning’s 5-miler and Thanksgiving morning’s 5K. I’ll recap the race later this week, but suffice it to say, it was a blast! With so many of my friends running, how could it not be fun? It didn’t hurt that I ran a great race despite doing zero speed work this summer/fall. I finished in 25:50 (8:20 pace) and won my age group. I chose not to run on Saturday morning, because late in the race on Thursday I felt a twinge in my right glute/hamstring. During my easy run home after the race, I was very aware of it and caught myself limping. It’s worth noting that I ran this afternoon (Sunday) and felt pretty good! I adjusted my strength training to Sunday and Tuesday so I’d have Wednesday off to rest before the race. I’d planned to lift again on either Friday or Saturday, but ended up skipping it, choosing to work on Christmas decorating instead. 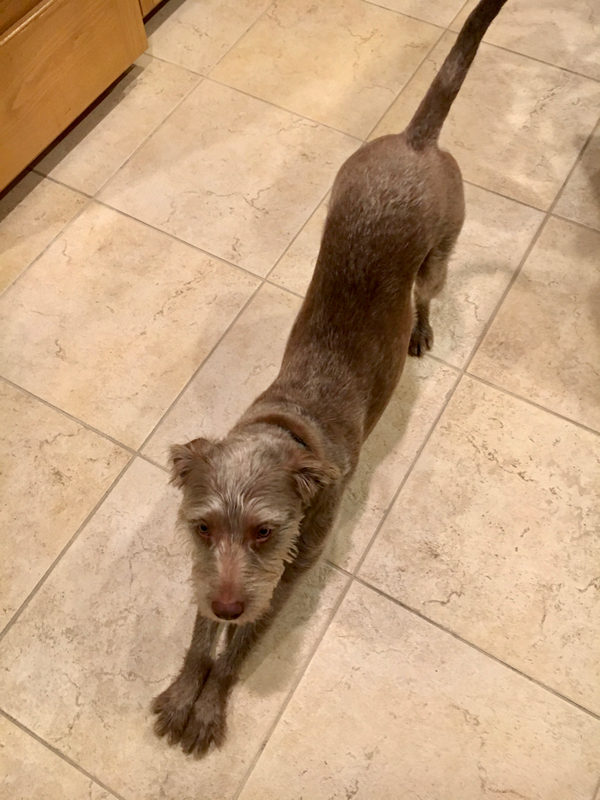 Pablo continued to try to teach me a perfect downward facing dog, but I just couldn’t pick it up! He was so cute and stayed right next to me both days while I did my yoga. Friday – I plan to join in on the Ultimate Coffee Date fun with Deborah and Coco. How’s your downward facing dog? 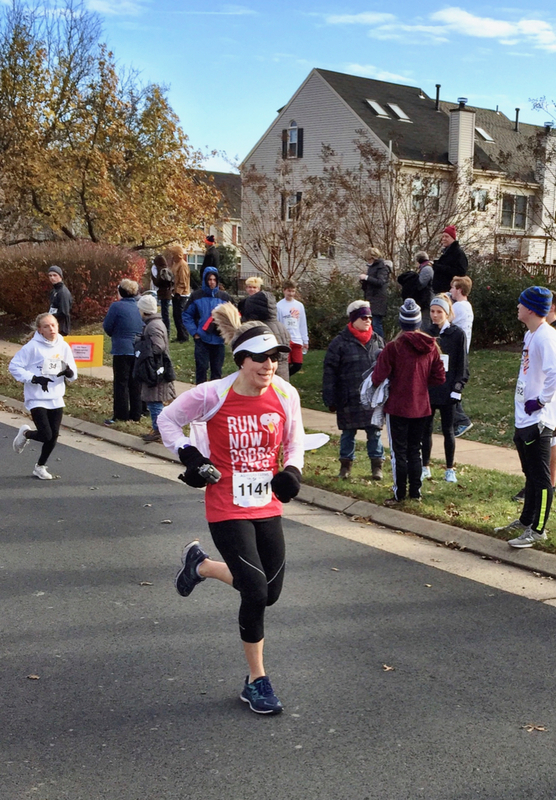 Did you race on Thanksgiving Day or this weekend? Pablo is just too cute! Congratulations on your age-group win. Having everyone home for family dinners is such a treat! Thanks, Karen! Yes, it was wonderful having everyone here for a couple of days. It looks like you had so much fun keeping the grand dog. He is adorable. Congrats on a well paced 5k and the age group win! Don’t feet bad about the light week. With all the things we women do around the holidays, some things have to give. And decorating counts as cardio anyway. 😉 Thanks for linking! Thanks so much, Holly! And you’re right, with all of our Christmas decorations stored in the basement, I ran a lot of stairs this weekend! Pablo is so cute–I think you should just keep him at your house! Congrats on the 5k AG win! You’ve still got it. And thank you, it’s nice to feel really good about a race once in a while. I agree! I hadn’t raced since Independence Day and what a difference! 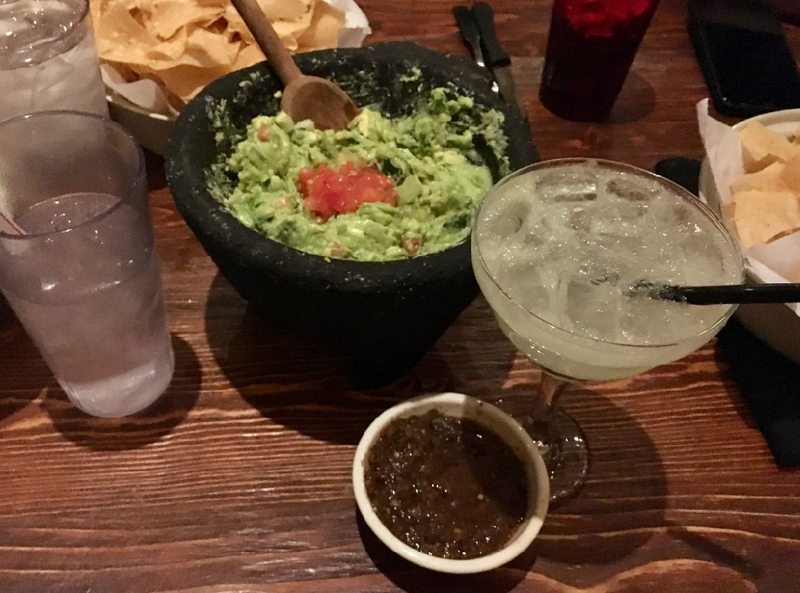 Your book night guacamole and margaritas look soooo appealing! My Benji “helps” me do yoga too. He does a mean down dog!